Antler Ridge vacation rental log cabin. Antler Ridge has three bedrooms and lots of deck space to enjoy the fresh air and mountain views. Deciding whether to hang out on the deck or relax inside is a frequent dilemma of most guest at Antler Ridge. The professionally cleaned outdoor hot tub is privately located on the side deck. Watching the clouds cast shadows across a scenic mountain view is a relaxing way to spend an afternoon. 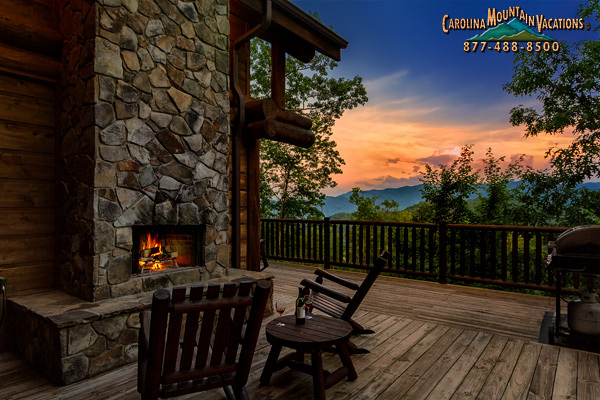 Beautiful view of the Nantahala smoky mountains from the large wrap around deck. The private lower deck of the master suite is a quiet spot to sit and enjoy the view. 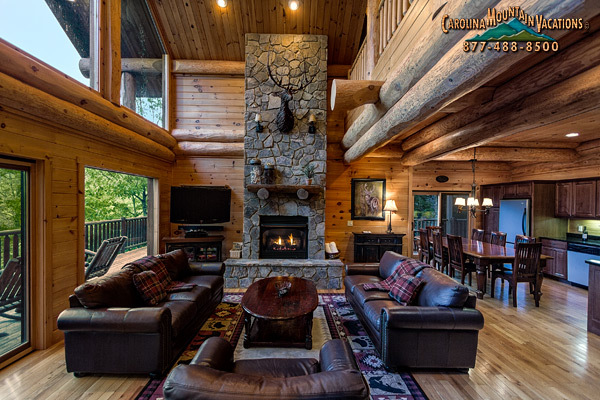 From the comfortable leather sofas of the living room watch the gas log fireplace or the satellite TV or the clouds over the scenic mountain view it is your choice. 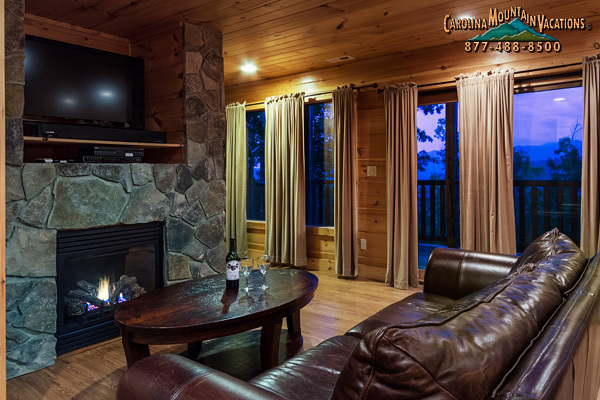 Comfortable leather sofas in front of the gas log stone fireplace and flat screen TV in the living room. A game table in the living room next to the stairs up to the game room and down to the master bedroom. The bedroom on the entry level has a king size bed, satellite TV and sliding glass door access to the wrap around deck. Play a round of 8 ball on the regulation size billiards table while watching the game on the satellite TV in the game room. 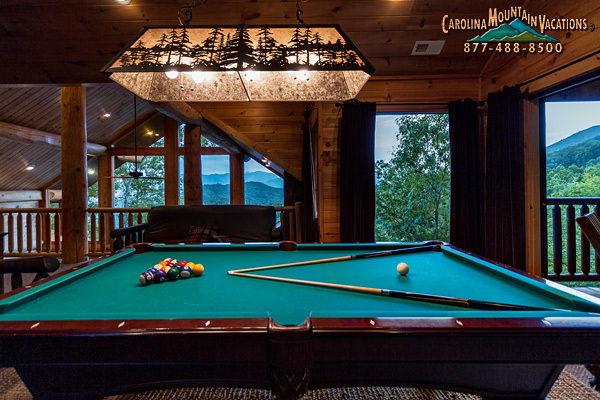 The covered upper deck is a great place to enjoy the fresh mountain air while waiting your turn on the pool table. The two futons in the game room provide seating for spectators of your billiard skills or just extra sleeping space. The master bedroom on the lower level has a king size bed across from a gas log fireplace and satellite TV. End your evening watching the late show in front of a fire on a comfortable sofa in the master bedroom. The master bath on the lower level has a large shower. The eat-in kitchen is fully stocked with all cooking and dining utensils plus seats seats 10 guests using the two chairs at the game table. Plan a meal out in the fresh cool forest air as the sun sets for an exceptionally smoky mountain dining experience. 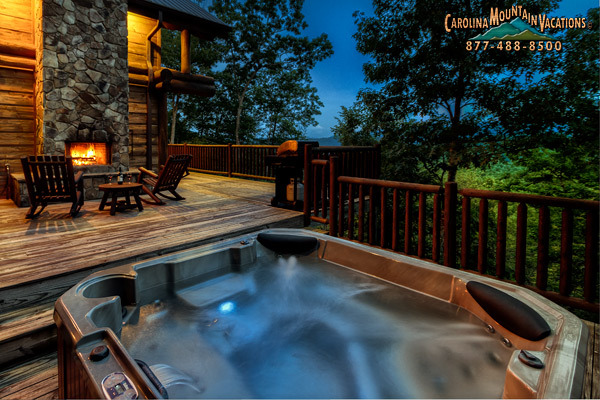 Soak in a hot tub in front of a wood burning fireplace as the stars fill the sky above. Unwind to the sounds and warmth of a wood burning fireplace as the sun sets over a scenic mountain view. 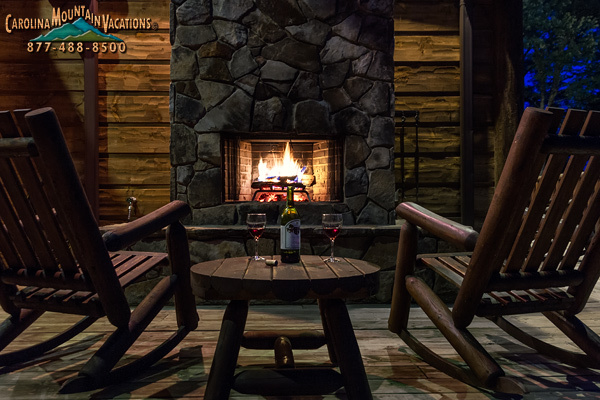 A quiet relaxing evening in front of a wood burning fireplace outside in the fresh cool mountain air. How late into the night the fire burns in the fireplace is up to you. Though many of the sunrises over the view are shrouded in mist the sunsets are often very beautiful. Out on the side deck is where most guest spend their evenings. With plenty of illumination your outdoor fun can last late into the night. The paved roads to the cabin end at the sign and a gravel parking area is through the trees that hide Antler Ridge from neighbors. Rates are listed per night based upon 6 Guests. Antler Ridge is located in a gated community, just off Highway 28 a few minutes from the Almond Boat Dock on Fontana Lake and another public lake access spot for swimming, kayaking, paddle boarding and canoeing. 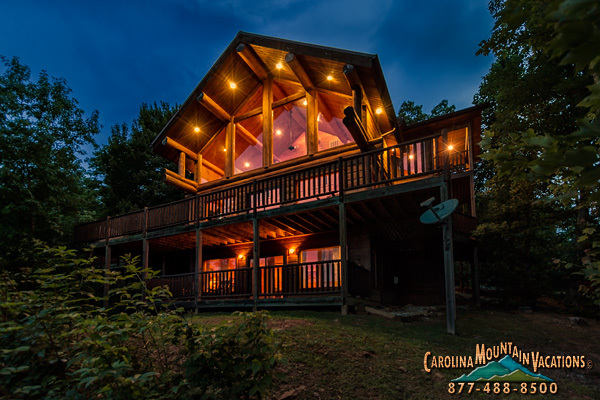 Antler Ridge is nestled on the side of a mountain with woods on three sides of the cabin and overlooking a gorgeous smoky mountain view. Any season of the year will provide a beautiful view of both mountains close up and mountain ranges far away. The drive to Antler Ridge is on a paved road that climbs the mountains to reach a majestic smoky mountain view. The mountain biking mecca of the eastern United States, Tsali Recreation Center is less than 10 minutes away. White water rafting on the Nantahala river is about a 15 minute trip away. Shopping, restaurants, train tours and the Great Smoky Mountain National Park are about 25 minutes away in Bryson City. The many shops, main entrance to the GSMNP and the cultural center or the Eastern Band the Cherokee Indians is about a 35 minute trip up highway 74 from the cabin. When you arrive at this cabin you will park on a gravel parking area behind the cabin. You can pull right up close to a set of stairs leading to the main deck and entrance. 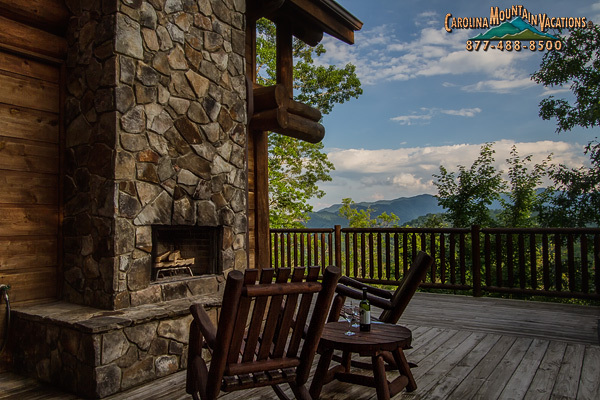 Here is where your journey to Antler Ridge becomes worth any and every effort; for, as you step onto the large side deck the beautiful view of the smoky mountains fills the horizon in front of you. This view seems to fill every part of this cabin, exterior and interior. The main entrance is a sliding glass door to the left of the stairs. The large side deck is the primary spot for outdoor activities. A picnic table is positioned across from the entrance to the kitchen and under the shading cover of the upper deck for dining out side in the fresh forested air. Past the picnic table the deck opens up to the sky above. 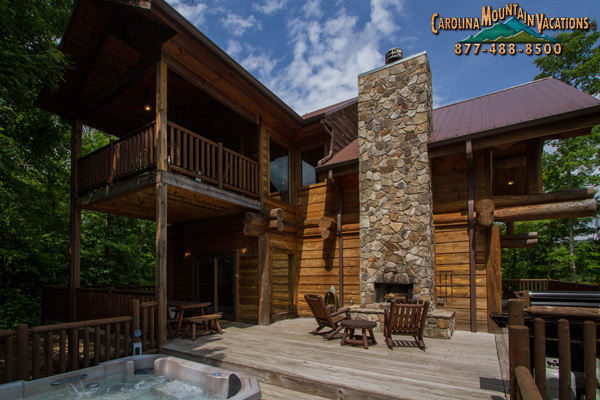 On a bumped out portion of the deck by itself sets a most inviting sight after a long day of playing and touring throughout the smoky mountains; a large professionally cleaned and private hot tub. 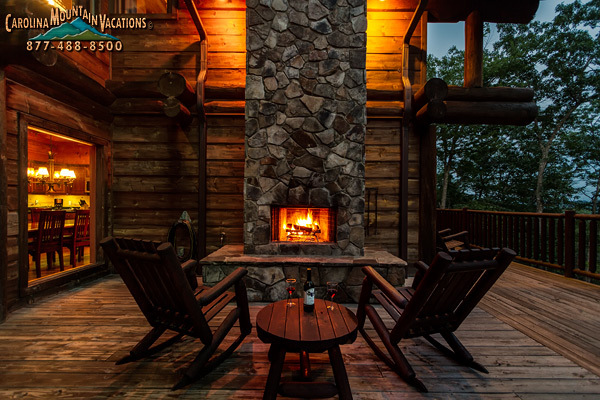 Across from the hot tub and surrounded by Adirondack-style rocking chairs is a large outdoor wood-burning fireplace. Sitting in front of a glowing fire while watching the sun set over the mountain view as the stars fill in the sky above is a smoky mountain experience to be remembered for years to come. A gas grill is also positioned on the deck to allow your grill master a view of the mountains as they are cooking their favorite meal. Propane and utensils are provided at the cabin. The deck continues to wrap-around across the front of the cabin where several more Adirondack-style rocking chairs provide a relaxing spot to watch the clouds drift over and through the mountain view. From here the deck continues to wrap around the cabin to the forest shaded side. Ending at a covered area where a sliding glass door opens to the bedroom on the entry level. The cover of this area is actually the private balcony of the bedroom on the top floor. Also on the top floor of the cabin is the deck that covers the picnic table and front entrance. This deck is also covered and has seating for four guest to enjoy the view while waiting a turn at the pool table just inside a set of sliding glass doors. The lower deck is accessible from the yard or from the lower level master suite. 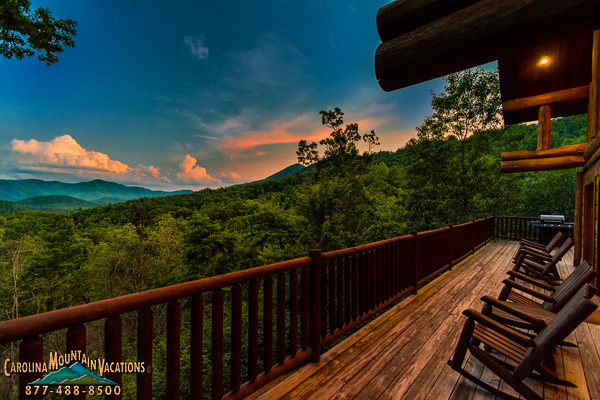 A pair of chairs offer a place to enjoy a morning coffee outside while watching the mist of the smoky mountains rise from the valleys below. 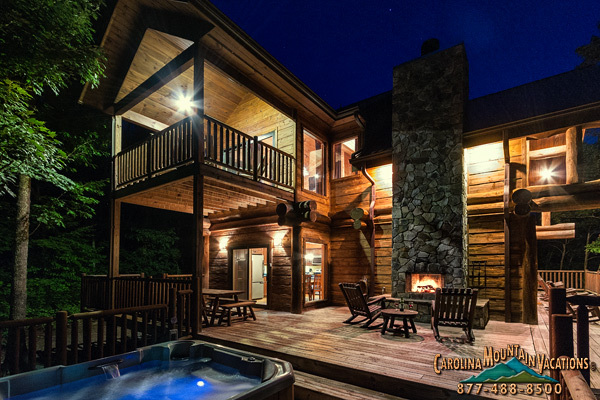 The exterior of this beautiful smoky mountain log cabin offers as much to do as the interior. . . Floor to ceiling glass windows, and sliding glass doors allow you to have a mountain view from anywhere in this beautifully decorated cabin. Entering at the main level, you will be in the dining room and kitchen area. The dining room table is set up for 8 guests at the table. The kitchen has stainless steel appliances and granite counter tops. Refrigerator, dishwasher, ceramic top stove, oven, microwave, and coffee maker are all standard in this kitchen. The great room includes a large living room area with hardwood floors and modern rustic decor. There is a large flat screen TV with Satellite service. Two leather sofas and a leather chair surround the gas-log fireplace area. Off to the side is a separate table for reading or playing checkers, while being a part of the conversation in the living room and kitchen area. A standard bathroom is off the side of this room. The bedroom on the main level has a King size bed, a flat screen TV and access to the wrap-around deck. The upper level brings you to a large loft room with two futon sofa/beds and a pool table. This room also has a flat screen TV to use while playing a game of pool. There is a deck off the side of this room that overlooks the hot tub area, and outdoor fireplace below. The upper level also has a standard bathroom and another bedroom. This bedroom has a Queen-size bed and a futon, a flat screen TV, and a private deck off the side. The lower level is the Master Bedroom suite with a King size bed. A large flat screen TV on the mantel above the stone fireplace with gas logs. A large leather sofa provides comfortable seating in the bedroom while watching TV or listening to music. A spacious Master Bathroom with walk-in shower and double sinks is off to the side of the bedroom. A washer and dryer is tucked behind folding doors, with easy access. The master bedroom has a private deck, as well..